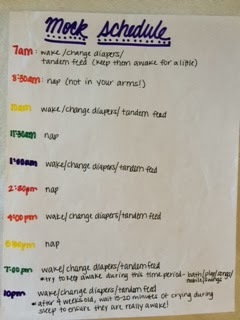 One of the things that helped me most when my twins were younger was seeing what babywise schedules other people had used. And the more I researched online, the more babywise schedules went on the back burner and just real life mom schedules came to the forefront. When I was pregnant, I made my original Babywise Schedule and I saved it! I just found it the other day while looking for paperwork. Written with 2 babies in my belly! We couldn't even begin our own schedule when the twins were born because they didn't come home from the NICU until they were almost 2 months old. The entire time my preemies were in the NICU they ate round the clock every 3 hours. So, I took that and ran with it. Below are the schedules we **tried** to stick by, broken up by month. Keep in mind: these were my planned schedule. Most days there was at least one two changes and I would just adapt from there! To read how I created and used a schedule for toddlerhood, check out my post on my toddler schedule for the twins. Thanks for posting this! I'm starting my 6-week-old on a schedule this week. The hardest part is waking at 7 too wake him! Ugh- I know! It's really like we're on a schedule, haha! Thank you so much, Jackie, for all of the great information you have shared here! I really appreciate it! both of our babies were NICU babies as well.. the schedule they started them off on is amazing bc they're structured right away.. I'm confused though.. why not change them through the night? Hi Anonymous, I know this is a month after your question, but maybe you're still looking for the answer. The reason you try not to change them during the night (unless it's a poopy diaper) is to encourage the babies to not really wake up at this point. They call it a "dream feed" because the goal is to feed the baby but not get them used to waking up during the middle of the night. 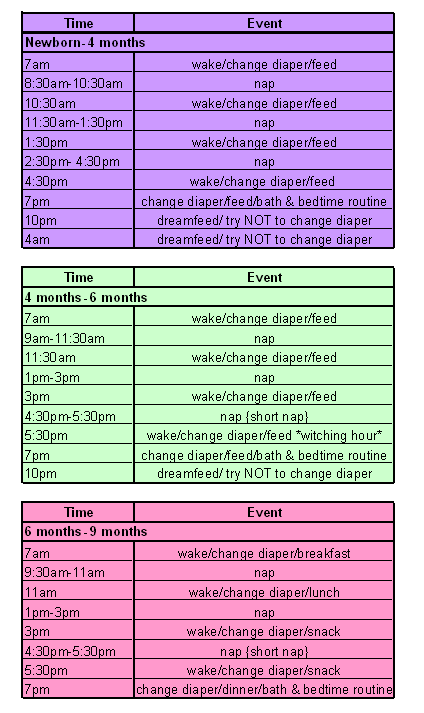 Thanks for posting this - I'm SO interested in your 0-4month schedule as I have a 7 week old who is pretty much doing the same schedule you have here. Question tho... for the 2 dream time feeds, HOW did you manage not to change their diapers without them becoming full and wetting their clothes? I have had 3 nights in a row where my boy has wet through if not once, twice, at both dreamtime feeds. I noticed on the 4-6 month chart you have the 5:30 nap marked the witching hour. What does that mean? Our 5 month old is always extremely fussy around that time everyday. She usually refuses her nap and then falls asleep during her 7:00 feeding. Hi, I have an almost 5 month old baby who needs to get on a better schedule. Currently, he only has one hour naps and I would love to get him to sleep longer. Do you have any advice on how I can get him to nap like your schedule says?